Last night I posted a PDF of the index of a layout draft document containing classes. Here, I have the index of a working draft of the Echelon Reference Series: Barbarian book. Same rules for indexing, but different data, including many feats and their associated diagrams. Many feat prerequisites and diagrams still need data cleanup. 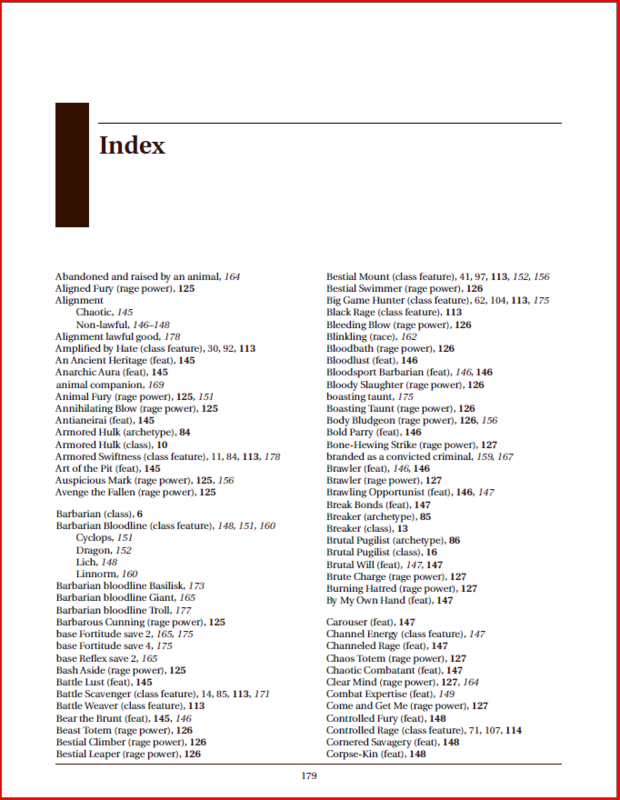 The “Barbarian bloodline” entries shown on the first page of the index should (and will be once the data is cleaned) “Basilisk (barbarian bloodline)”, consistent with “Aberrant (sorcerer bloodline)”. The “base Fortitude” entries shown here should probably be removed altogether (it’s almost like indexing ‘character’). In the right-hand column, “boasting taunt” and “Boasting Taunt (rage power)” should really be merged; “boasting taunt” is an artifact of the automatically-generated diagrams that has not yet been fixed. I really should fix the script that automatically generates the diagrams. I think making it just a bit smarter would remove a lot of the cleanup I need to do now — I can tell from the data that it’s a rage power, I should just skip ahead to that part and format it as such. Then my diagram cleanup can focus primarily on layout rather than fixing data. “Breaker (archetype)” and “Breaker (class)” should be changed as well. “Barbarian” is the base class, “Breaker (class)” here is actually the Barbarian class with the Breaker archetype applied. I think “variant class” would be a better label than “class”, since either one can be turned into the other — an archetype can be added to a class to make a variant class, and a variant class can have the base class “subtracted” to find the differences and make an archetype. Thankfully, applying archetypes to variant classes is outside the scope of this post… though since you can apply as many archetypes as you qualify for (have the exchanged abilities for) it’s actually not that scary to understand, just kind of funky to apply. However, while I am prepared to demonstrate the variant classes created by applying archetypes (seeing them as variant classes makes it much easier for me to understand exactly what impact an archetype has), I expect to take it to only one step, not try to apply all possible permutations. Fix title page. I want it to look much the same as the cover page, but simpler graphics and some more (required) text. Review and finish revising feat diagrams. There are many left to be done in the full feat set, but only a relatively small subset are needed for this book. Review and finish revising class feature text. This is mostly changing language from third-person passive to second-person active — “the breaker [or worse, ‘the barbarian with the breaker archetype’] is able to” becomes “you can”. As with feats, it is safe to assume that the class feature applies to someone who has it, and is reading the text. Second-person largely gets around he/she consistency problems and tends to be more engaging, active language is usually similarly more engaging and most often shorter and easier to understand. This is mostly done for the barbarian class features, not so much for class features from other classes, so I’ll focus on the class features that apply to barbarians so I can get this out. Class feature diagrams. I haven’t even started these, but considering how they interact they are probably a good idea. Many rage powers have other rage powers as prerequisites, and many feats have class features and class subfeatures (Rage Power is a feature, the Aligned Fury rage power is a subfeature of Rage Power) as prerequisites. Just as with feats, diagrams for the class features and class subfeatures will make the relationships easier to understand and thus the material easier to use. As with yesterday’s post, click the image in this post to see the PDF, or click Echelon Reference Series: Barbarian Draft Index.